IATA is the International Air Transport Association. Animalcouriers is an accredited IATA agent and can offer competitive rates with all airlines that provide pet air travel. 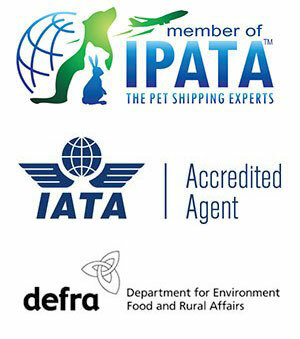 We work to IATA’s guidelines on the air transport of animals. IATA provides recommendations and sets standards relating to the air transport of live animals and provides information to help you prepare your animal for its flight. We provide travel boxes that meet IATA’s guidelines. You will need to provide us with your animal’s dimensions and weight. If your animal already has a travel box you will need to check it is still the right size. IATA stipulates that puppies and kittens under eight weeks old may not travel by air. Most airlines prefer them to be at least 10 weeks old and in some cases 16 weeks, depending on the length of the journey. There may also be other restrictions if the weather is very hot or very cold.